Clearwater’s in-house training provides organisations with an interactive learning experience. Our trainers are experts in their field and bring a wealth of knowledge and experience. All council staff responsible for the hands-on maintenance, or influencing the maintenance of street-scale WSUD assets. For example, maintenance crews, supervisors and managers often from multiple departments. Engineers and urban designers have often found this session very useful to gain an understanding of the maintenance practicalities. Note: We recommend 15 to 20 participants per session. Participants understand the basic concepts of WSUD and Integrated Water Management (IWM) – what it is and why we are doing it? Participants are familiar with the principles of WSUD assets including their function and key components - this enables them to better understand maintenance needs and implications. Participants have the skills to carry out maintenance inspections of WSUD assets using supporting checklists. Participants have a shared understanding of their organisations’ approach to WSUD asset maintenance. Participants build and improve relationships with colleagues who manage WSUD assets. Note: In addition to the above, we are in the process of developing a Stormwater Harvesting session as an addition to the above module options. Please contact us directly should you be interested in this product. Each session incorporates a number of tailored components enabling you to communicate your organisation's strategies and plans to build awareness and buy-in. In particular, the facilitated discussion with action planning activities at the end of the session encourages staff feedback and discussion on current maintenance issues. This final session will also work with your staff to determine what is required to develop ongoing commitment for managing these assets. Costs are based on Clearwater delivering the session in-house to a group of 15-20 participants and around Melbourne's Metropolitan Area. 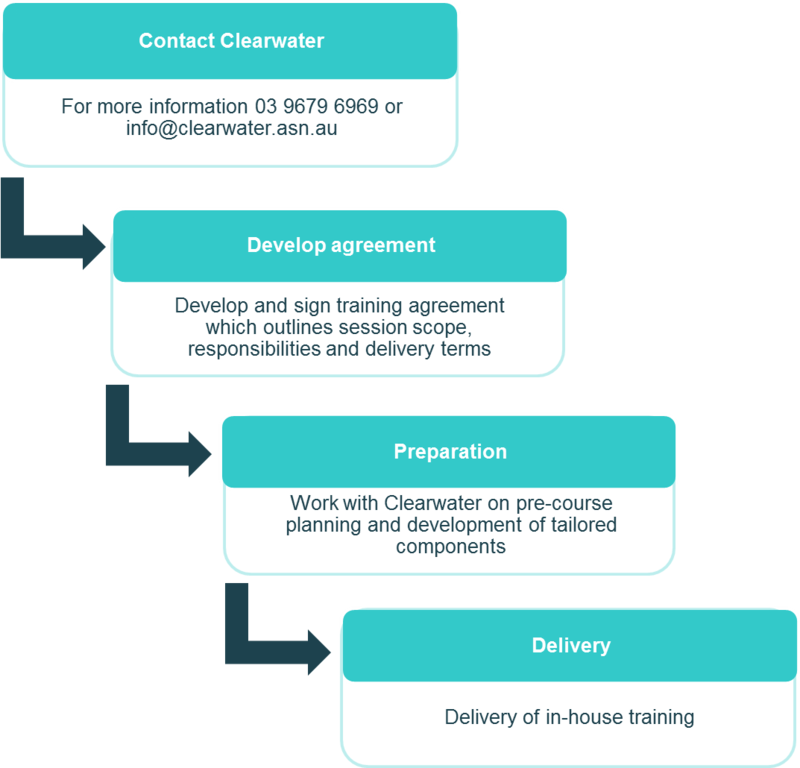 To allow enough time to successfully plan your session we require at least 6 weeks between the training agreement sign-off and the delivery of the training course. 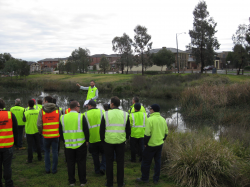 Clearwater’s Wetland Maintenance Training was a specifically tailored and professionally delivered training session to meet the needs of not only on-ground wetland maintenance staff, but also helped inform the design and construction phases for wetlands and other WSUD assets. All our staff who attended the day gave glowing feedback that it had improved their understanding about the different components of wetlands and how these should be maintained. The session gave both theoretical and practical examples of wetland function, and was well suited to our audience. I would like to thank the Clearwater team for designing and delivering such a clearly planned and targeted training session. I would like to thank Clearwater for all their hard work in putting together and presenting the Maintenance of Street-scale WSUD Assets in-house council training. It was an excellent training course, pitched at exactly the correct level with the appropriate mix of theory and practicality. Everyone I"ve spoken to enjoyed the day and thought that they gained something out of attending. This training will make a huge difference to the team here at Moreland as part of our WSUD journey.